After your arrival in Switzerland you will take a train to reach the venue. 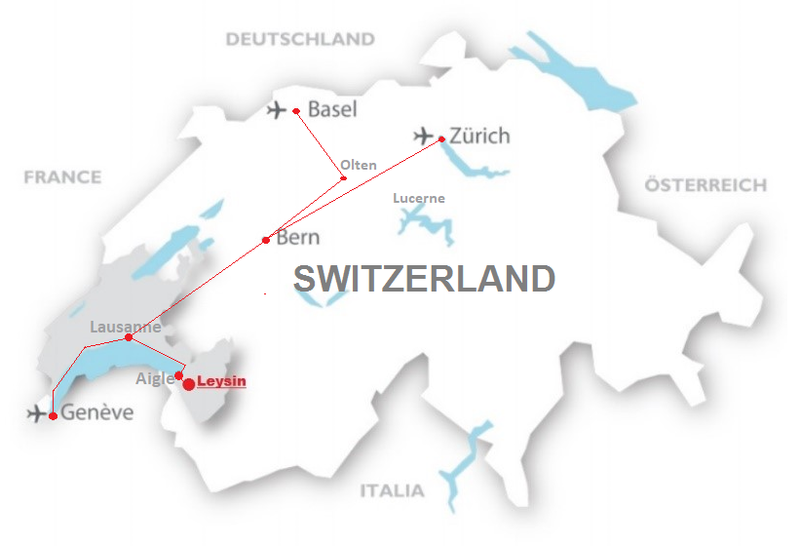 The exact name of the train station in Leysin is: LEYSIN-FEYDEY. You will have to book a train connection till there. Here are some useful information and details how to do that as soon as possible in order to pay the lowest possible rate for the trains. Remember, the regular prices of the train tickets could be even 70% higher than the options that we suggest here. These are the regular prices for the train tickets which are valid during the whole day when you buy it. You can use any connection going in the designated direction of your ticket. Even if you miss one train connection, you can wait for the next one and the ticket will still be valid until you reach Leysin-Feydey. You can buy the tickets ONLINE. Or you can buy the ticket once you land on the airport. The price will be the same. However, we do not advise you to take the regular trains, but to book much cheaper tickets online before you arrive, which are called SUPERSAVER TICKETS! These tickets can be booked online two months before traveling. It is important to know that there are limited number of tickets of this kind. Therefore, you should book the tickets as soon as possible for the arrival day on 20 August 2018 and also for going back from Leysin-Feydey to the airport on 29 August 2018. Even more important: these tickets are different from the regular ones. Namely, the Supersaver tickets are valid ONLY for the designated times written on the ticket. This means that you will have to travel according the route stated on the ticket. You cannot take any other connections in different time than the one stated there. So please pay attention to this important information and the schedule of your train connections. When booking your tickets, take into consideration the time needed to pass through passport control, take your luggage and reach the platform (approximately 40 minutes). After you book your train tickets online you will get them as pdf files. Please send the tickets as pdf files to Ena via email and for yourself you have them printed. (there is a option to get the tickets on your mobile phone if you like as well). Room Check-in starts at 15:00h. As we mentioned before, you have to be at the hotel latest till 18:00 o'clock. We are looking forward to welcoming you in the nice cozy hotel in Leysin. Subkult organized the training course YOUTHIFICATION in 2016 for the first time and last year in 2017 for the second edition, 32 youth workers gathered on the Swiss Alps to explore the topic of youth centers. The project in 2017 was focusing on experienced youth workers from 11 countries from Europe who are working in different kind of youth centers, youth clubs or youth structures. We are now happy to be able to organise the third edition of the project this year. Application forms, travel arrangements, packing and handling the way up to the Swiss Alps in Leysin is finally over and it is in the past. All participants arrived on time and met their roommates and colleagues with whom they are going to spend the next 8 days. Subkult took care everyone to have the right information in order to prepare themselves for the training course. Subkult strives to enable people to participate in local, national and international exchange and mobility projects. By providing access to different learning opportunities, the association gives valuable contribution to their personal and professional development. The association wants to inspire and motivate people to discover empathy and values, through engagement in and exploration of different challenges. Being faced with cultural diversity, people develop their competences and learn to learn in a non-formal setting. By gaining valuable know-how, people are empowered to take social, political, cultural and economic action in the society. Subkult strongly believes that through this process people are becoming responsible active citizens who are capable to create a better and sustainable world.